Spring break for Quinnipiac students also means the QU Baseball Team has its traditional Spring Break foray to the warmth of the south. Their 2nd stop on their southern tour brought them to FGCU (Florida Gulf Coast University) in Fort Myers, FL. 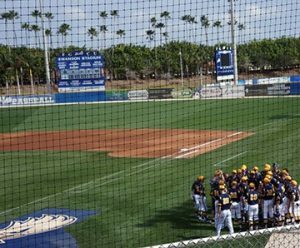 They played 4 games in 3 days against the FGCU Eagles. The last game was on Sunday, March 13. I am currently on Sabbatical in Naples, FL which is about 15 miles from Fort Myers. So what could be nicer than on a low 80s day to travel to see my QU team tackle the Eagles of FGCU. My wife and I arrived at the FGCU Swanson Stadium at 10:30 AM for the 11:30 game. The FGCU Stadium is a beautiful venue for a baseball game. 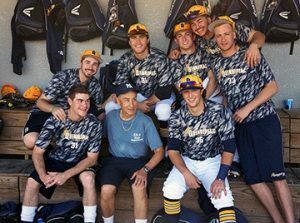 A few of the QU players had actually taken my “Baseball and Statistics” course at QU. Of course being on Sabbatical in FL for the spring semester I am not teaching my favorite course this semester. Upon entering the dugout I was welcomed by the players. In fact, I found out 5 of the players are currently taking my course and they remarked how much they liked Boyd Johnson, a former student of mine, who replaced me in the course for this semester. 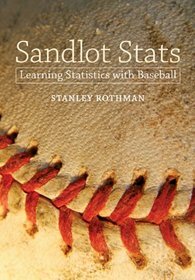 I then asked the current students how they liked my book “Sandlot Stats: Learning Statistics with Baseball.” One of the students signaled with a hand motion. They all laughed and then responded the book was fine. I took a picture with some of the guys which you see here. Onto the actual game. At the top of the first inning QU was retired without scoring. Then came the bottom of the first. The first four batters got hits and before you knew it three runs had scored and the bases were loaded with no outs. I envisioned a 20 to 2 game. But, amazingly QU’s pitcher Taylor Luciani got out of the inning without allowing any more runs. The game stayed 3-0 after the first three innings. QU then got solo runs and tied the score at 3-3. The offensive attack was led by John Brodenhamer who drove in two of the three runs with a solo home run and a double. The third run scored when Brian Moskey scored from third base on a passed ball. We sat in the stands and were surrounded by many parents of the players. One entire family there was the Moskey Family. The family included the grandparents, mom and dad, and big brother. They all cheered for Brian. The QU fans around us also cheered BBBB. I talked to other parents and they told me they were glad their sons were attending such a fine university. Back to the game. 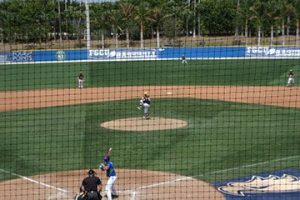 In the 6th and 7th innings the FGCU Eagles broke the game wide open scoring 7 more runs. The game ended with QU on the short end of a 10-3 score. Behind us sat 2 FGCU fans who I spoke to about their team. I asked them if any current FGCU players are Major League candidates. They said their second baseman Jake Knoll who is batting .391 after 15 games was being scouted by several Major League teams. If you are wondering if any FGCU player has made it to the majors, well, you heard of Chris Sale. Yes, he played for FGCU. Sale was one of only 6 players in MLB history to play in the big leagues the same year he was drafted, after being selected 13th overall in 2010. Can you name the other 5? QU also had one player in the majors. Remember the antics of Turk Wendell? Well he was from QU. My wife and I departed after 3 hours of an enjoyable day which featured perfect weather and a well-played game at a beautiful stadium. Of course, the day would have been better if QU had won. “Baseball follows me wherever I go.” … and you follow your students wherever they go. They’re on break, so give them one!